Find out what's new at Imperial Machine & Tool Co.
Imperial’s Director of Additive & Hybrid Processes, Joseph Sinclair, has become the first graduate from Penn State’s new Master’s Degree program. Imperial is pleased to announce that it has been acquired by Kaiser Aluminum Corporation. We’re proud to add Two more metal additive manufacturing systems to our Metal AM Department, bringing our total to 4 Metal Additive Manufacturing systems. Imperial Machine & Tool Co. is proud to announce we've achieved our AS9100 D certification. We're extremely excited for the next chapter. Subcontractor of the Year Award - Imperial Machine & Tool Co.
We're honored to be recognized by the U.S. Small Business Administration (SBA), and thankful to all our customers and dedicated employees. One of our Hybrid Manufacturing collaborations with Penn State's CIMP-3D was selected for a Modern Machine Shop magazine feature. 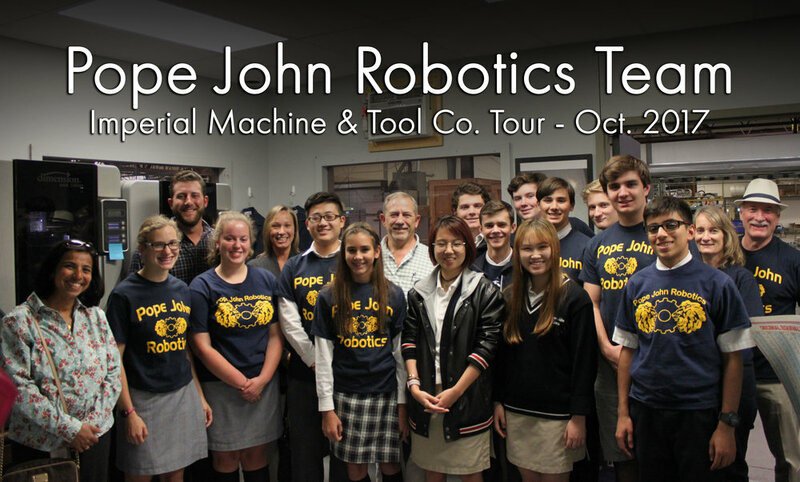 The Pope John Robotics Team came by to learn about Metal Additive Manufacturing, and manufacturing career options. We got some great photos as students encountered Metal 3D Printed parts for the first time. The Vortic Watch Company restores antique, American-made mechanical watch movements and houses them in modern 3D Printed Titanium cases. The results are stunning. We're proud to share that we made the cover of 3D Metal Printing Magazine. The article provides a great look into the workings of Imperial and has cool pictures of Hybrid Manufactured parts, too. 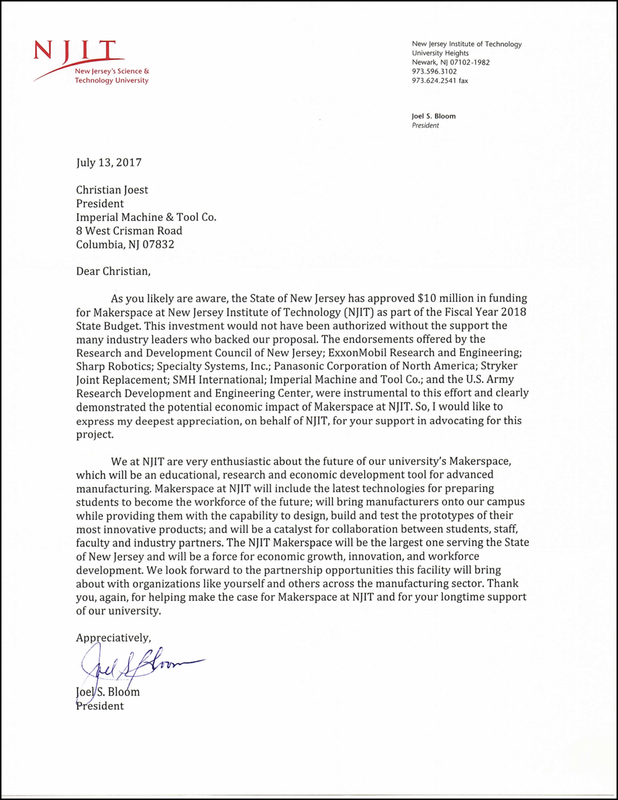 Imperial is proud to support the newly announced Makerspace at the New Jersey Institute of Technology. By providing the manufacturing equipment and facilities for students to explore their ideas (and connecting them with experienced industry veterans) we can help nurture the next generation of innovative thinkers. 3D Printing Industry published a 2-part feature highlighting Imperial's approach to overcoming the additive manufacturing skill gap. We're pleased to announce the addition of Dr. Michael Begarney to the Imperial Machine & Tool Co. family as Chief Scientist. Our new co-op program allows young folks still in high school to get a taste of the manufacturing world. Karen is our first MCTI co-op and she's been a fantastic addition to our team. We met some great folks at RAPID + TCT 2017. Here are some pictures from our first time exhibiting at the show. We found this vintage brochure while looking through a box of old family pictures. A fascinating look at Imperial in the 1960s. We're honored to be featured in the very first episode of Marty Wolff 's Business Builders show on the new C-Suite TV Network! Marty visited our facility and conducted an interview with President Chris Joest. A great look into how and why we do things at Imperial! Imperial is extremely proud to make the cover of Modern Machine Shop Magazine. In addition to the hybrid manufacturing photo on the cover, Imperial is highlighted in an 8-page feature article as well as an editorial by Pete Zelinski. Imperial's former President, George H. Joest Sr., passed away peacefully at the age of 86. He was a 30-year prostate cancer survivor, and believed the most important part of life was spending time with family. We're going to miss him dearly. We're honored to be featured in Metal AM magazine. This article takes a look at how and why Imperial got into metal additive manufacturing. Imperial is presenting at RAPID + TCT 2017! We'll be sharing real-world insight about incorporating metal AM into a traditional shop environment, and cover the importance of Hybrid Manufacturing. Visit us at booth #1841! Imperial Machine & Tool Co. is proud to be a Tier 1 supplier for the M777 Howitzer program. Learn more about the re-launch of the program here.